As companies continue their business activities over time, they face a variety of unexpected problems at different points in time. In order to dramatically improve labor productivity, it is necessary to incorporate cutting-edge technologies that are rapidly advancing day by day, to promote operational efficiency and automation. In our New Tech consulting, we will contribute to the improvement of labor productivity surely and promptly by consistent support from selection of advanced technology to actual introduction support and establishment. 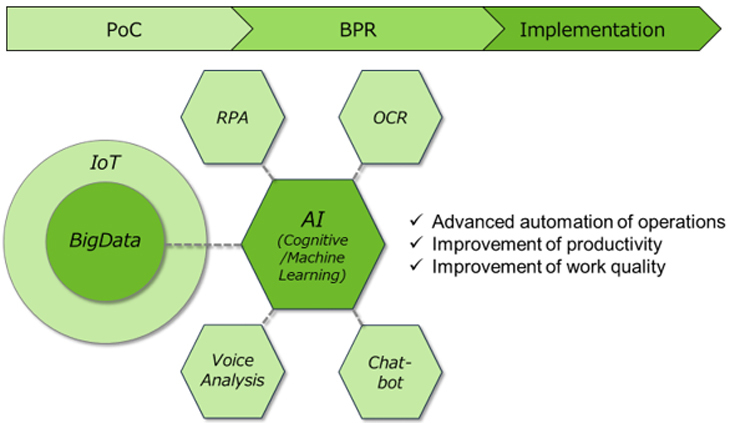 In New Tech Consulting of Rise Consulting Group, we will provide consistent support from introduction of advanced technology such as AI / RPA / IoT / Block-Chain to practical introduction of technology, from the viewpoint of business reform, we will comprehensively grasp the entire corporate activity, and will achieve business efficiency and automation that will produce sustainable results at an early stage. By making full use of experience and knowledge based on our past achievements, we can minimize the enormous time and cost required for the business reform. ©RISE CONSULTING GROUP All Right Reserved.